Estimated time on air will be 13-20th of March as ZL7/OE2SNL, afterwards I`ll be mainly QRV in CW as operator for ZL7AAA. I will fly from Munich via Dubai to Auckland and from there to Chatham Island. Please note I am a one-man-show and will not have the resources to be on the air on more than one band and one mode at a time. Nevertheless I will do my best to work as many stations as possible whilst my stay. Please be patient in the pileups and get sure about the current operating style. If the internet connection works, I will periodically upload my log data. UPDATE 20.03.2014: Franz has changed his QTH and is member of the ZL7AAA team now. Unfortunately ZL7AAA has no internet connection at the moment! 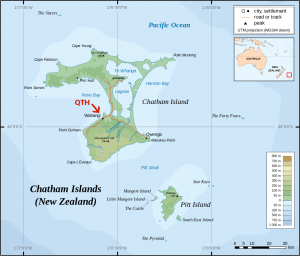 UPDATE 27.03.2014: Franz should be on his way home already, but he could not get the booked flight from Auckland to EU due a delay from the Chathams (weather). So he will arrive in MUC on April 1st and will stay in AKL for 4 more days. Many thanks to all stations for working Franz! His ZL7/OE2SNL logbook lists 4.025 QSOs in 6 days. Enter your callsign and hit the check button. NOTE: ALL QSL-CARDS HAVE BEEN SENT DIRECT OR VIA THE OE-BUREAU. Donations are still accepted! Donators from US-$ 4,- and up will receive a direct QSL automatically! If we can`t see your call from your PayPal address you`ll receive a separate request to tell us your callsign and QSL address! please note: Direct cards not including SAE and return postage will be answered via the bureau!